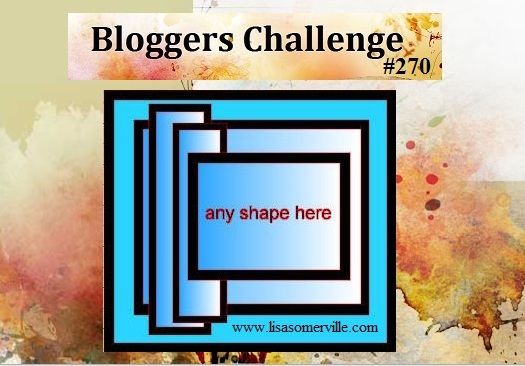 Happy Bloggers Challenge Friday! Thanks to those who played along with last weeks Masculine Card Challenge, I know I can always use more inspiration for manly cards. This weeks challenge is a favorite of mine, it's a Sketch Challenge. Use the sketch provided below as your inspiration, feel free to rotate the sketch or swap out the focal panel for a different shape, but try to keep the sketch recognizable. This would have been perfect to post yesterday for the 1st day of Summer! Inspired by the sketch, I swapped out the square focal panel for an oval, all pattern paper is from the My Minds Eye Indie Chic Citron collection. The quote is from Verses Rubber Stamps (MC0653-E One Night Stand), stamped in Grey on Minds Eye pattern paper then cut with Spellbinders Petite Ovals. To embellish I added some Zva Creative Crystals and Roses that were sponged with Guava ink. This is beautiful, Lisa! Love the pearl leaves for the flower. What a GREAT sentiment! Still lol. Beautiful take on the sketch with those lovely colors, so pretty GF! Beautiful card, the sketch is great. No black layer--that's unusual for you! I do love that sentiment and so true! Lovely subtle Summer card and great sketch challenge! Hope your weekend is not too hot or humid! this sentiment is so perfect with these papers and those flowers. Beautiful job with the sketch. Beautiful sketch and papers. Love your card.